There’s a problem with reviewing whisky. Apart from finding the time. It’s deciding what to drink, and what to review. Regular readers will know I tend to drink a few staples: Bunnahabhain (though recently less of the 12 year old, more of the Toiteach), Lagavulin and the 12 Year Old Highland Park. But I like to break out of that, stop myself falling in a rut. But how? The temptation is the big ticket, high price, old age single malts: the 40 year olds, the special bottlings. The problem with these is they’re priced in the many hundreds, the thousands of pounds. Which means one bottle is affordable, but what if I really like it. Like I did with the 40 Year Old Bunnahabhain? I can’t justify that sort of money on an everyday whisky. But something in the £50-150 range is usually better value than the standard, entry level (but still eminently drinkable) £25-40 range. So the sensible way to go is up in age, from the 12 year olds to the 18/21 year olds. And where better to continue that into the new year than Highland Park, one of my permanent residents of Dad’s old Monk’s Bench? 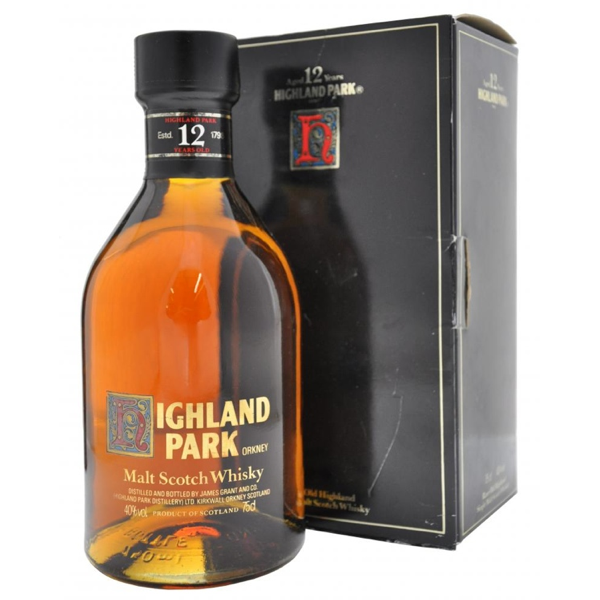 The 21 Year Old Highland Park is right at the top of that price range, but is affordable as more than a one off buy. As you pour, the colour is rich, warm, honey like. The aroma isn’t strong, though, you have to get your face right into your glass to really get a good waft. This malt was matured in sherry seasoned oak casks, and that comes through clearer than is usual, the flavour is good, strong, has some fruit and of course some smoke. And a nice long aftertaste that lingers long after it should. It’s that aftertaste that’s the best part, though. Although this bottle is good, and I’d happily drink it if you were paying, ultimately it’s disappointing. The aroma isn’t rich enough, the first taste doesn’t quite grab you enough, the full flavour doesn’t quite fill your mouth enough. It’s good, but not £150 good. I just feel that it costs a little more than it should. Bring the price down to two figures and we’ll talk again. Or send me a bottle of your 1970. That I’d love to review! 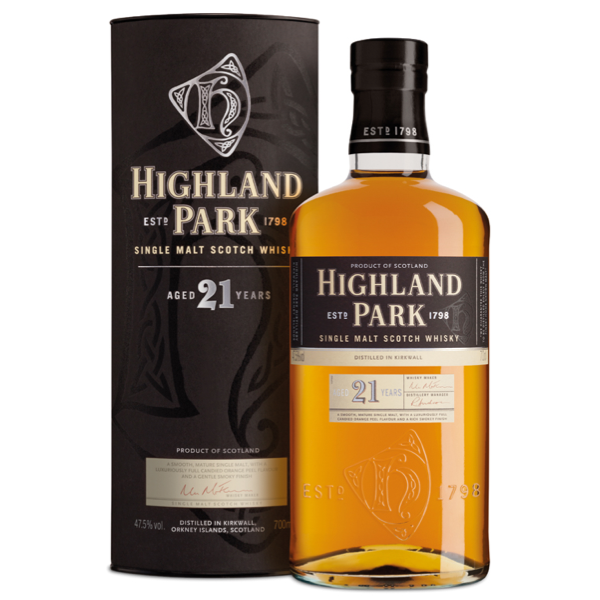 I was surprised when I planned my whisky week blogs that I haven’t reviewed Highland Park before. It’s a regular resident of the Monk’s Bench, and except for a short period in the last few years, I’m never without a bottle. There’s a good reason for this: It’s the first favourite of mine that I discovered for myself, rather than something I was introduced to by Dad. In fact, after I introduced him to it, he, too, was never without a bottle. It’s the only one of my permanent top scotches that isn’t an Islay whisky. It’s still an island single malt, though, coming from Orkney. Again, as is a theme with my favourites, it’s very easy to drink. You get a real sense of the heather, the peat, and (helped along by the colour) the honey. The smokiness has the edge taken off by a sweetness that the mainland malts just don’t seem to be able to emulate. It is simply delicious. My bottle isn’t the shape of the one in the picture, and that’s one of the things I like about this scotch. The neck is wider than most bottles. It used to be wider still, but in narrowing it, the distillery have kept the very satisfying baritone glugging sound it makes as it pours. The bottle sits well in the hand as you pour, so all told this becomes a wonderfully complete experience: tactile, the sound, the aroma and the taste. Why would anyone ever want to be without it? This or the Bunnahabhain is what you buy me for a happy christmas.